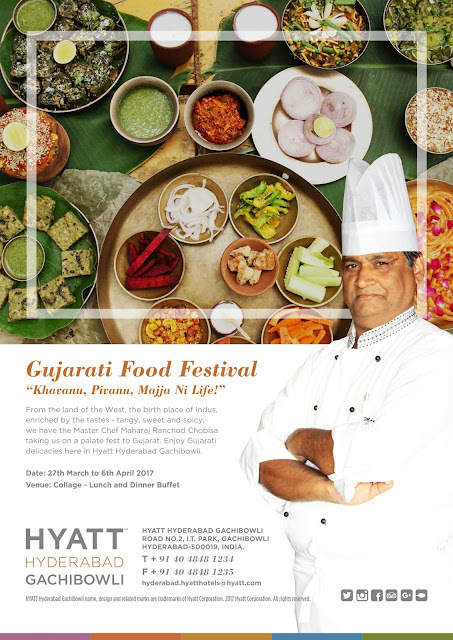 Curating the festival is Master Chef Ranchhodlal from Hyatt Ahmedabad. 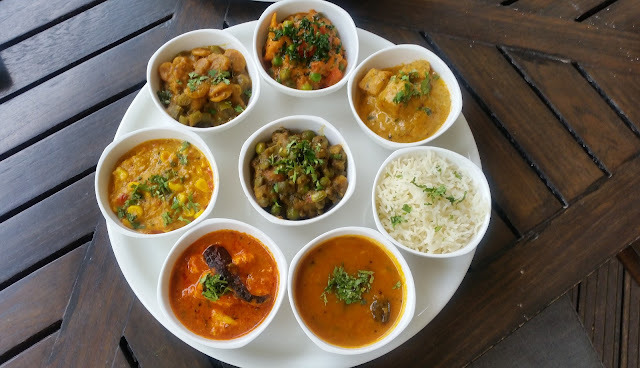 Originally hailing from Udaipur in Rajasthan, Chef has organized Gujarati food promotions in India and abroad. 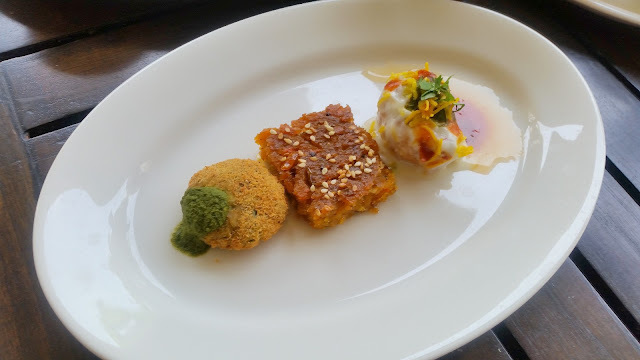 At Collage, the all-day dining restaurant at The Hyatt, he patiently explained to us the finer nuances of Gujarati food from different parts of the state, for example, how curd is used frequently in Kathiawadi cuisine while people in Saurashtra like spices in their food. The food festival is presented in form of a buffet for both lunch and dinner. I had reached Gachibowli after travelling across the city in this sweltering summer, and the Chaas (Gujarati butter milk preparation) had a big role in cooling me down. The drink was really special, prepared by the chef himself. 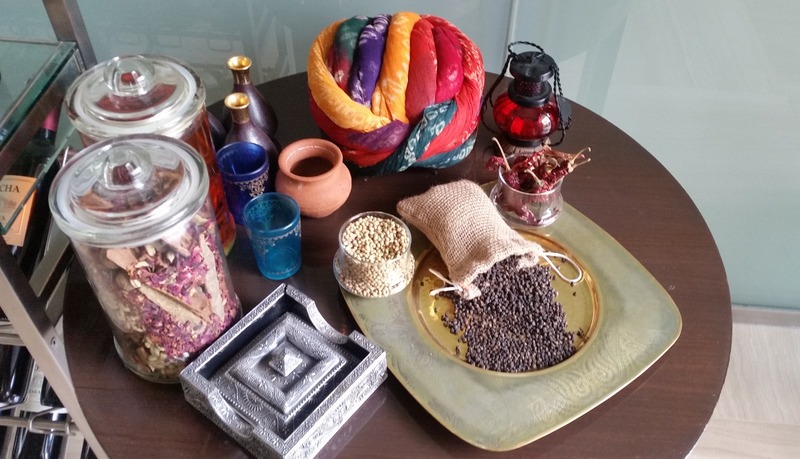 It had roasted jeera, curry leaves and a host of other spices, and even a little bit of ghee in it. Next was a visit to the live Chaat station. Here the choice was quite wide, including Dahi Wada, Sev Puri and Papri Chaat. Notable was the array of chutneys which were used for preparation, I noticed about ten types of chutneys and masalas. We decided to try out the Papri Chaat which was a slightly sweeter variant compared to the Bombay version but had a balanced taste otherwise. Among the appetizers, Subz nu Handvo was a traditional Gujarati dish. The lentil and vegetable cake was cut into square shaped pieces and the chef advised me to pour some sesame oil which was served with it. Kalmi Vada the deep fried round dal pakodas went well with the green chutney. The spread for the main courses was extremely elaborate. Makai Mangroil, a corn cob masala was one of the favourites here. Undhiyo, a signature Gujarati dish was served from the kitchen was extremely tasty with the assorted vegetables and methi muthiyas. 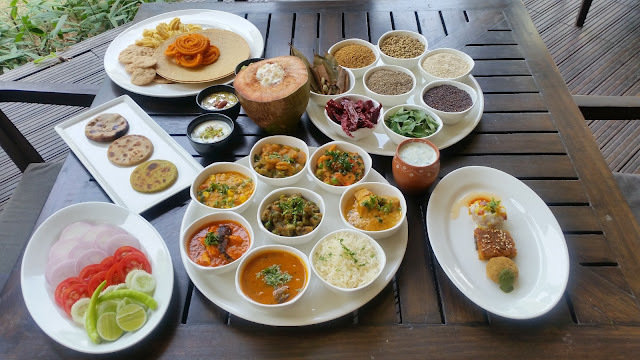 To go with the main courses, a range of local bread were served – Methi Thepla, Bajra Roti and Bhakri. Another interesting dish was Fansi Dhokli - besan dhoklis are cooked in a gravy with beans. Athana Paneer was a red coloured gravy which was surprisingly not very spicy in spite of the presence of the red chillies. The dal of the day, Dal Whara was a sour-ish concoction which is tried with the steamed rice. Apart from these, there was also tomato and capsicum dish which tasted rather nice. I am no expert in Gujarati cuisine, but I must say this was quite a fulfilling meal. I liked the curation of the main courses, as care was taken that each dish was quite different from others. 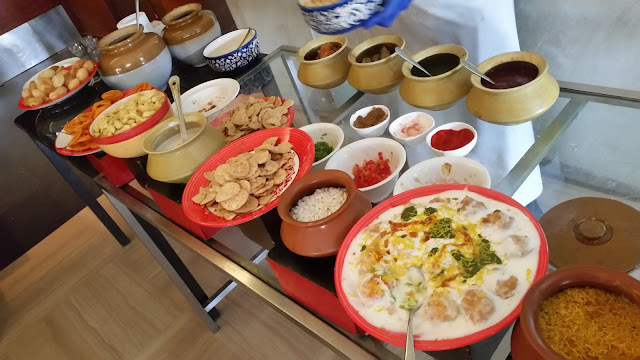 A range of papads and pickles were served as sides. 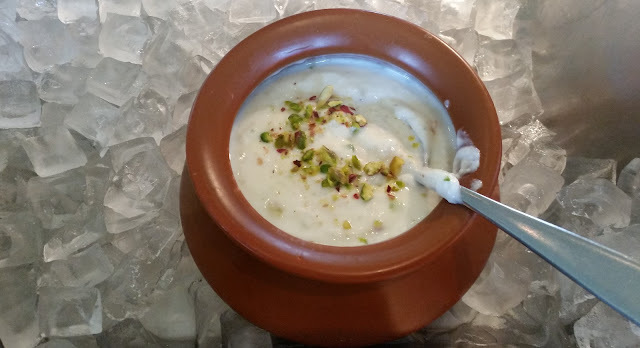 The pick of the desserts was Janat Ni Mete, a preparation of tender coconut and milk. Tastefully served inside a tender coconut shell, this required a second helping from even a dessert averse person like me. Pista Shrikhand was smooth. 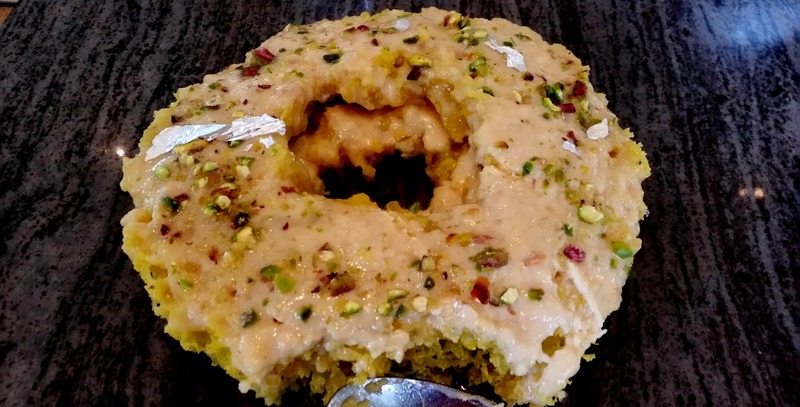 Kesari Ghevar was too sweet for me, though I am sure it will be a hit with dessert fans. Dudhi Halwa, a bottle gourd based sweet which is popular even in part of Northern India was the other sweet served. 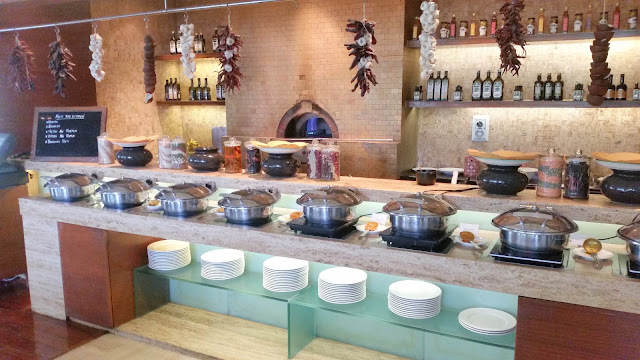 The buffet has other items too apart from Gujarati delicacies to cater to the in-house guests of the hotel. However, I was in no mood to try them as the Gujarati items were so good. Chef Ranchhodlal told me that he hopes to be soon back with his Rajasthani food promotion too. The Gujarati buffet is attractively priced – Rs 1250 for lunch and Rs 1400 for dinner.